From young college students to spry seniors, from empty-nest mothers to men and women with traveling spouses, from bachelors to the many people between relationships, millions of us dine alone every night. But what do we eat? Is it takeout, a frozen dinner, or our favorite gourmet meal? 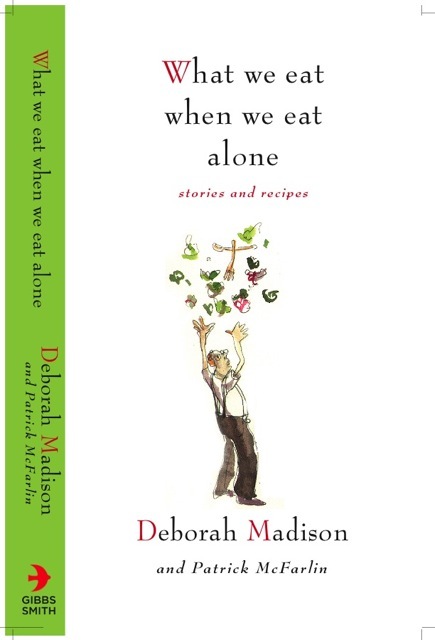 In What We Eat When We Eat Alone, the husband-and-wife team of chef and writer Deborah Madison and artist Patrick McFarlin set out to learn what people chew on when there isn't anyone else around. The responses are surprising and far-ranging. Some solo diners relish the elaborate, while others prefer the bizarre. Some eat their favorite foods, some eat what's convenient, and others choose their menus according to their moods. The book is illustrated with the art of Patrick McFarlin, capturing the flavor of the stories. It also includes great recipes at the end of each chapter for those who dine alone, including tips on making smaller portion meals and also on using leftovers in different recipes for those who don't want to eat the same dish night after night. Our relationship with food is one of the defining and intimate relationships of our lives; it says a lot about who we are and how we live. Part cookbook, part memoir, part pure fun, What We Eat When We Eat Alone explores the joys and sorrows of eating solo and gives us a glimpse into the lives of everyday people who do.